Published: Oct. 25, 2016 at 02:09 p.m. Updated: Oct. 26, 2016 at 10:07 a.m.
DENVER — Authorities say a fan has died after falling 30 to 50 feet at the Denver Broncos‘ stadium after a game on Monday night. Stadium Management Co., which operates Sports Authority Field at Mile High, said the fan fell over a stairwell railing. The medical examiner’s office said Tuesday the man was transported to a hospital and pronounced dead. His name has not been released and a Denver police spokesman did not immediately provide details about the investigation. The incident occurred near the north end of the stadium following the Broncos‘ game against the Houston Texans. “The Denver Broncos are extremely saddened to learn that Jason Coy, the fan who fell over a stairwell railing at Monday night’s game, has passed away. Along with Stadium Management Company, we extend our deepest sympathies and condolences to his family and friends. Perhaps no sporting event in the world is harder to safeguard from terrorism than a giant footrace in a big city. It’s practically impossible. Unlike stadiums with limited access points, major marathons spread themselves out over 26.2-mile courses near skyscrapers and subways. In Chicago and New York this month and next, they also will have at least 35,000 runners watched by more than a million spectators, all subject to countless risks during an event that lasts several hours. “The security apparatus continues to hold its breath to get through these events,” said Jim Reese, a former U.S. Army Delta Force officer and current private security consultant. Just last month, a pipe bomb exploded in a trash can along the course of a 5K charity race in New Jersey. No one was hurt. And now comes the next test, on Sunday at the Chicago Marathon, where much has changed to ease the breathing since the Boston Marathon bombings in 2013. Like other marathons, Chicago has significantly beefed up its defense systems, including a stronger law enforcement presence on the course, more rigorous checkpoints in populous areas and added surveillance cameras that now number more than 22,000 across the city, according to one estimate. By those measures, marathons are safer than ever. But the threat is never zero in a free society, no matter how much of a police state these cities become on race days. It’s all still a guessing game of sorts, rooted in fear. Since Boston, the guessing at marathons now is just better organized, more focused and more expensive, according to officials and experts contacted by USA TODAY Sports. Despite the added brains and brawn, a homegrown terrorist with no prior record still might have little trouble infiltrating the event as a spectator or runner. Some might even try buying access to sensitive areas through a private security company staffer, a scenario that was demonstrated in a troubling case at a Chicago Bears game last year. One big difference now, since Boston, is that such possibilities are discussed and defended against in a more collaborative and organized way through the National Center for Spectator Sports Safety and Security, also known as NCS4. 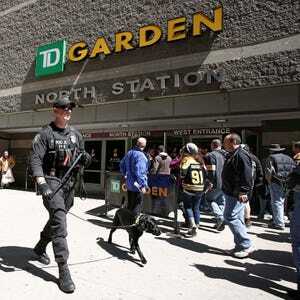 Before Boston, NCS4 director Lou Marciani primarily concerned himself with the security of sports stadiums. That was the big nightmare scenario for decades — a possible bombing in a crowded stadium, as was depicted in Black Sunday, a movie that came out in 1977. After Boston, NCS4 now consults with top marathon officials and has an annual summit with industry leaders to discuss best practices, this year scheduled for Dec. 12-14 in Biloxi, Miss. It also has developed a 162-page “best practices” guide for the marathon and endurance events industry, a checklist to help maximize security, including the encouragement of background checks for security personnel, the use of uniform and plainclothes officers and tightened access at the start and finish line areas. In Chicago, one of the new initiatives since Boston is that only registered runners showing their race bibs can enter the start and finish line area in Grant Park before the start. All people entering Grant Park must go through a security screening throughout the day, and spectator access to the finish line is limited to ticketed guests only. Similar measures are in place at other marathons. In 2013, at Boston, the bombers carried bombs in backpacks, which exploded outside a secured area near the finish line, killing three and injuring more than 260. The Boston Marathon now urges spectators to leave backpacks at home. It has enhanced screening near the finish line and added more plainclothes officers who are trained in detecting the behavior of a would-be bomber, said Lt. Mike McCarthy of the Boston Police Department. NCS4 urges marathons to consider banning backpacks, among other items. “Certainly the implementation of best practices now associated with the start/finish line would have mitigated risk (at Boston in 2013) but could not have guaranteed that event would not have happened,” Marciani said. With marathons, “you just don’t ever have enough manpower” to secure them, said Reese, the security consultant at TigerSwan, based in North Carolina. To make the most of what they have, marathon officials coordinate and plan security operations with local, state and federal authorities, who help with intelligence. Ciaccia said the security, medical and emergency management budget for the New York City Marathon has doubled since Boston to more than $1 million. The marathons also have access to more cameras, which helped identify the Boston bombers in 2013, as well the suspect in the recent bombings in New York and New Jersey. About 150 cameras have been added to the Boston portion of the Boston Marathon, McCarthy said. Three years ago, Chicago authorities had access to an estimated 22,000 cameras. That’s increased by an unspecified number since. Authorities “have a network of surveillance cameras that they use and can see the majority of the marathon course,” Pinkowski said. The idea is not to just catch criminals after the crime, but to let them know they’re being watched and to locate problem spots or medical emergencies on race day. The tradeoff for this expansion of surveillance technology is a reduction in privacy. Government is watching more and more. It’s a matter of what the public finds acceptable in exchange for safety. Surveillance cameras “are part of a larger and growing system of electronic surveillance that increasingly turns our private lives into open books,” said Adam Schwartz, an attorney with the Electronic Frontier Foundation, which defends civil liberties in the digital age. In 2013, USA TODAY Sports published an investigation about the private security companies hired to screen bags and search spectators at stadium entrance points. The investigation found the private security industry is loosely regulated and that workers for such companies sometimes have criminal backgrounds and are classified as “event staff” instead of security guards to avoid licensing and training requirements. Last November, Chicago police arrested two private security company workers at a Bears game, accusing them of conspiring to sell access to the stadium to two undercover officers for $80. Neither of the employees for Monterrey Security had a security guard license, and both had records for drug arrests, according to the Chicago Sun-Times. The CEO of the company, Juan Gaytan, said those employees didn’t need to be licensed because they were not guards but instead were involved in “guest services,” the Sun-Times reported. A stadium official said the situation was rectified to prevent this from happening again, and Gaytan said the employees were fired. The judge still acquitted one of the workers, saying there wasn’t enough evidence against him. A warrant was issued earlier this year for the other worker, the one who allegedly sold the cops access. Though it may have been an isolated incident with no harm done, it demonstrates the soft spots that might be out there for exploitation. NCS4 urges background screening on all staff and contractors. Its goal is to mitigate risk, even though it can’t eliminate it completely. They’ve still come a long way in the three years since Boston. There were no arrests at the past two Boston Marathons, McCarthy said, “Not even for public drinking.” Likewise, officials for the New York and Chicago Marathons credited law enforcement for their enhanced safety. Suspects charged with first- and second-degree assault. UPDATE 3:25 p.m. ― The Baltimore Sun reported Tuesday afternoon that Joseph Bauer had showed signs of improvement, giving doctors a thumbs up at their request. “We have been encouraged by some signs we believe indicate he recognizes his wife,” his sister told the Sun. Joseph Bauer, a 55-year-old Baltimore Ravens fan, remained “unresponsive” Monday after a stadium fight in Baltimore Sunday with two Oakland Raiders supporters, according to reports. The two suspects, Scott Smith, 30, of Mount Vernon, New York, and Andrew Nappi, 31, of Eastchester, New York, were charged with first- and second-degree assault and released on bond. Bauer, a former Marine from the Baltimore suburb of Jessup, has been unconscious since the incident during the Ravens-Raiders game at M&T Bank Stadium. According to a police report cited by the Sun, Nappi said an argument started, then Bauer threw a bottle at Smith’s head and Nappi punched Bauer in the face. Bauer’s wife, Sharon, said Smith pushed her husband to the ground where he hit his head. 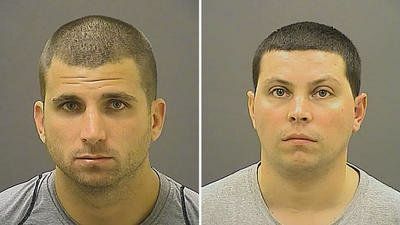 Scott Smith and Andrew Nappi face first- and second-degree assault charges for a stadium fight that left Joseph Bauer with a severe brain injury. CBS reported that the encounter may have been the result of a good deed by Bauer. His sister told the station that he let someone cut in line at a concession stand, which sparked an argument with the two suspects. Ravens coach John Harbaugh offered “sympathies and condolences” to Bauer and his family. The man wielding a machete in the Colorado athletic department was shot and killed by police, according to a statement by the CU Boulder Police Department. Colorado coach Mike MacIntyre told the Jim Rome Show his team was on the practice field when the incident occurred. “We were on the practice field, fortunately,” MacIntyre said. “He was in our building. I don’t know all the details of it at all. I’m still on lockdown as I talk to you. We’re not allowed to go up into our building. I’m on the first floor. We were at practice. It didn’t affect any of that. Our young men have just left the room, and we can leave here in a little bit. It’s still in the middle of it, so to speak. MacIntyre said there were other football employees in the building when the man entered. He said the coaches were made aware of the incident and to stay where they were. “The first thing that went through my mind when I heard, I was in the middle of practice, they called down and said we couldn’t leave practice and just to keep going,” MacIntyre said. “All the ambulances and stuff were going by. My first reaction was that I hope everyone’s safe in our building. We still had employees in the building, especially the football employees working our recruiting, all the different aspects. Athletic director Rick George announced shortly after the incident that no one other than the machete-wielding man was injured. Police shot a man Wednesday who entered the Colorado athletic department offices wielding a machete. According to reports and tweets from University of Colorado Police, a text came into the police department a little after 9 a.m. alerting authorities to come to the Champions Center, a facility near Folsom Field that houses the Colorado athletic department, including the school’s football coaches. By 9:23 a.m., police had cornered the man in a stairwell and, according to the police scanner, he was shot in the lower back and taken into custody. CU police officials would not reveal the condition of the suspect or whether anyone was injured. It also would not confirm whether shots were fired. We will update this post when more is known about the condition of those involved. The nation’s top counterterrorism official testified Tuesday that the world’s army of terrorists is “broader, wider and deeper than any point since 9/11,” the day al Qaeda attacked America. The nation is facing a phase in which people quickly radicalize and launch simple but deadly attacks before authorities have time to detect them, he said. His testimony to the Senate Homeland Security Committee conflicts with upbeat reports from the White House, which has focused on territorial losses in Syria and Iraq as signs that the Islamic State is being defeated. The Islamic State group, also known as ISIL, ISIS and Daesh, has set up its so-called capital in Raqqa, Syria, and controls Mosul, the second-largest city in Iraq.